If you have read books about the Rhodesian Ridgeback, you could be forgiven for thinking that there were no hunting dogs in southern Africa until the white settlers arrived. But if you read the articles of Johan Gallant, President of the Africanis Society, on the ancient native hunting dogs there, you can then see the real situation. You can at the same time read of dogs so virile that they have survived for thousands of years without veterinary medicine. Breeds like the I-Baku, the I-Twini and the I-Bansi, as well as the better known Sica dogs, have survived not only harsh terrain and an unforgiving climate over countless centuries but also their encounters with dangerous quarry too. Lions are unlikely to be too tolerant when their own hunting grounds are disturbed by man. In Rhodesia the early settlers and hunters developed what was originally called the Rhodesian Lion-Dog but is now known as the Rhodesian Ridgeback, a distinguished hound breed. But further south, the settlers developed a different type of 'Lion-Dog' and from mastiff ingredients. A writer in 'The South African Kennel Gazette' of March 1909 recorded: "I remember in 1860 seeing a fine strain on the Thorn River near Cathcart...these dogs were light-red in colour, wiry coat with massive heads, fairly fast and large. They were very vicious...about 1870, I saw some fine Boer dogs, answering the above description, excepting that they were darker in colour...I had two dogs, the one named 'Kafir', whose sire was a cross between a bull and a mastiff, dam a foxhound. The second named 'Smoke', whose sire was a cross between a stag and bloodhound, dam a mastiff. These dogs had all the characteristics of the Boer hunting dog." This same writer mentions that in the 1860s military posts were 'scattered about the frontier' and at each post could be found bloodhounds, staghounds, greyhounds, bulldogs, terriers, mastiffs, pointers and sometimes foxhounds. Another writer to this issue of the Gazette describes how as a boy, fifty- two years earlier (i.e. in 1857), he had hunted tiger and baboon using "...a cross breed between the mastiff and the bulldog, the parents coming from Europe. The boar-hound, though big and strong, is too fine skinned to withstand the claws of a tiger, and...the mastiff, though strong and big, is too lumpy and no match for the nimble tiger; the bulldog is plucky and tenacious, but owing to his lightness, the tiger...can throw him...The cross-breed, that is the mastiff and the bulldog, combine the swiftness and tenacity of the one with the strength of the other, and have always proved to be the best for fighting with a tiger." This quote should not only please Bullmastiff fanciers but indicate why medieval hunters in Europe used running mastiffs to chase the big game but used killing mastiffs, with heavier heads and thicker skins, to close with their quarry. There are records too in South Africa of a Jan van Riebeeck arriving in the Cape in 1652 with his 'Bullenbijter' or broad-mouthed mastiff-type dog. Such a dog would have been employed in Northern Europe as a catch-dog or pinning and gripping breed. 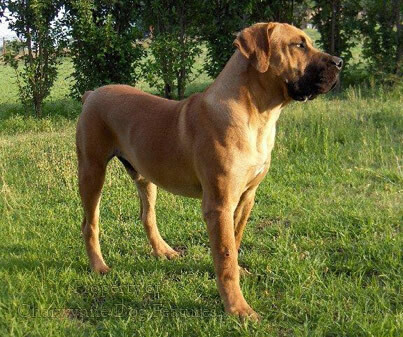 Today in South Africa, the surviving hunting mastiff, now called the Boerboel, is being carefully bred by a devoted group of fanciers. In August 1990 the first country-wide appraisal tour was undertaken to identify future breeding stock. This tour covered 5500 kilometres, involved the examination of 250 dogs, from which only 72 were selected to be registered as a breeding base. A number of founder members then started a breed society: Johan de Jager, a sheep farmer from Utrecht in Natal, Dr Andre du Toit, a wine grower from Paarl Valley in the south, Lucas van der Merwe, a game rancher from Kroonstad, Johan du Preez, an engineer from Senekal, the Nel family from the eastern Free State and Mrs Owen from Warden. Since then they have been joined by another half a dozen key breeders: Leon Riekert of Pretoria (with his Leonard stud), Babs Bosman from Douglas (Ravata), Ella Louw from Volsrust (Waterval), Steyn Opperman from Ficksburg (Christian), Nic van der Linde from Standerton (Geelbos) and Klaas van Waveren from Pietersburg in the Transvaal (Ysterberg). 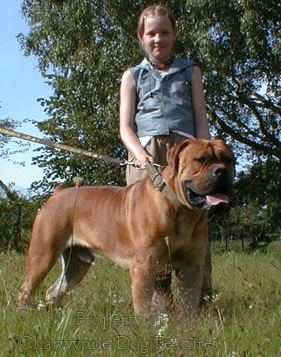 The emergence of mastiff breeds like the Boerboel, the Gran Mastino de Borinquen in Puerto Rico, the Perro Cimmaron of Uruguay, the Ca de Bou of Majorca and the Cao de Fila de Sao Miguel in the Azores is immensely pleasing; after years of misuse, overuse and neglect by man, this remarkable group of dogs is now receiving the recognition it deserves. The Boerboel appears to feature all the best attributes of the mastiff breeds: immense power combined with great faithfulness, physical stature combined with admirable tolerance and a temperament capable of placidity or ferocity, if its family is threatened. I do hope that the more patriotic Boerboel fanciers don't now come up with a breed history claiming that this breed is directly descended from Brabanter Bullenbijters, brought to South Africa by Dutch settlers in the 17th century, has been kept on remote farms for three hundred years and only recently surfaced, to display characteristics only previously shown in the hunting mastiffs of Assurbanipal two thousand years ago. A comparable claim was misguidedly made for the unwisely named Pharoah Hound from Gozo a decade or so ago. The claims ended when it was pointed out that every sizeable island in the Mediterranean has its own version of the bat-eared sighthound and that Gozo, far from being isolated, was visited by every marauder and colonist in that part of the world for several thousand years. The Boerboel looks to be a magnificent breed, developed in a hard school by tough farmers who were threatened by every kind of dangerous predator, in testing terrain and a challenging climate. Resouceful pioneer farmers didn't have the circumstances which exactly encouraged the conservation of rare breeds of dog. They had a need for brave powerful virile dogs and bred good dog to good dog until they obtained the desired result. The way in which the Rhodesian Ridgeback was bred by hunter-farmers is probably a model for all such dogs. Performance directed every breeding programme. Pure-breeding, handsomeness and a respect for heritage doesn't usually feature highly in a pioneer hunter-farmer's priorities. It should be a matter of pride that the Boerboel was developed from the best mastiff-type dogs available in South Africa and brought there by soldiers, colonists and settlers from Europe. It is a breed to be proud of for that reason alone. As a registered, pure-bred, recognised breed of dog, the Boerboel will need a well-worded breed standard if it is to be bred true to type and function in future years. It is disappointing, therefore, to read the first issue of this standard and assess the impact of its wording on breeders who have simply no concept of what a dog like this was expected to do on a lonely farm in the early days of South Africa. 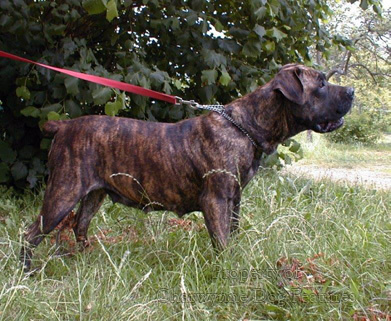 Under 'General Appearance', the Boerboel is expected to be bigger than the Boxer but shorter in the leg than the Great Dane; no mention of its mastiff type. Under the head description, it stipulates that the nose bone must be straight, with very little or no tilting up like the Boxer and no longer nose like a Great Dane. I know of no other breed standard which tells you which features of another breed are not to be copied. Sadly the tail of this breed is preferred cut short, unlike nearly every other mastiff-type breed of this size. For me, this spoils the symmetry of the dog and makes the rear end appear rather Bulldoggy. The muzzle does not have to feature the black seen in our equivalent breed, the Bullmastiff, and a light eye is permitted. It is so good however to see that this standard sets out clear guidance on the muzzle length, guidance so vital in a modified brachycephalic breed where shortness in the muzzle can mar the appearance of the head, an important feature in every breed with this build. The emergence of this breed is more than welcome and I salute those visionaries who had the interest and enterprise to save it for all of us. Of a totally different type are the tribal dogs of South Africa. This remarkable group of dogs has been researched and then publicised by Johan Gallant in South Africa, after centuries of European indifference. Any group of dogs which can survive without ever receiving any veterinary care, in a testing climate like the South African bush and operating in terrain which would challenge any functional animal, deserves attention. The Africanis is believed to be a direct descendant of the domestic dogs which came to southern Africa with the Iron Age migrations of the Bantu speaking people. These dogs were then taken up by the resident Khoisan people. These dogs were never bred for type but type developed from function. Natural selection has not only eliminated inheritable diseases and provided a natural resistance to internal and external parasites, it has created a virile, healthy, functionally excellent animal, repeating the formula applied automatically by primitive dog breeders all over the world. It is only in the highly civilised countries where, paradoxically, sickly short-lived dogs are bred from because they are handsome or conform to a rigid blueprint. There is nothing exaggerated or extravagant in the Africanis; their coats adapt to the seasons, they move with great economy of movement and their owners have no obsession with ear carriage, their dogs can have drop ears or erect ones. These dogs have survived in a harsh setting and are genetically important. Of interest to Rhodesian Ridgeback fanciers is the appearance of the ridge on the spines of some of these dogs; the Kalahari San were seen in south-eastern Angola as recently as 1954 with ridged hunting dogs. The Khoi were reported as long ago as 1719 as having dogs about 18" at the shoulder, with a sharp muzzle, pointed ears, with a body like a jackal's and a ridge, or mane, of hair turned forward on the spine and neck. The original Khoi dogs of Namibia, like the Kalahari Tswana dogs, had the appearance of medium-sized Greyhounds and some sported ridges. One hundred years ago, the Khoi were reported as having a dozen ridged dogs near Naauwpoort, from where, in 1901, a Scots Guards' officer is said to have had two ridged dogs in his 'bobbery' hunting pack. The Venda dog, like the I-Twina, possesses a tall, slender, lightly-boned physique and relatively large, 'bat' ears, much like the hunting dogs depicted on ancient Egyptian artefacts and may have a north African origin. Stayt, in 1931, described these hounds as 'excellent and trusty bush dogs'; they were used to bay lions, guard cattle and hunt buck. The I-Maku is more Basenji-like, with replicas in the Luangwa Valley in Zambia and the BaSenji of Zaire. The I-Baku have been linked with Arabian dogs, perhaps through Islamic trade routes on the eastern coast of Africa. These remarkable dogs deserve our admiration for their survival alone. They represent a triumph of natural selection over fickle human whim; we should value their genes and assist their conservation. No doubt before they could be brought into Britain they would have to be vaccinated, something we need when we go to their native land but they certainly don't. Veterinary scientists would be wise to study such dogs and be humbled by them.